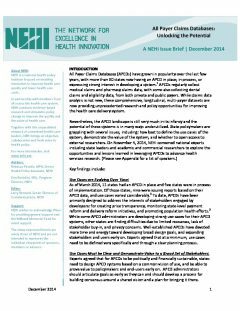 All Payer Claims Databases (APCD) across the country are providing unprecedented research and policy opportunities to improve health care delivery, according to a new issue brief published by NEHI (Network for Excellence in Health Innovation ), with support from the Milbank Memorial Fund. But the databases are only starting to be used to their full potential as policymakers grapple with how to best use them. This policy paper is based on a roundtable discussion, convened by NEHI in November 2014. Find out what state leaders and researchers had to say about exploring the opportunities and lessons learned in leveraging APCDs to advance health services research.